A new ceasefire effective March 5. 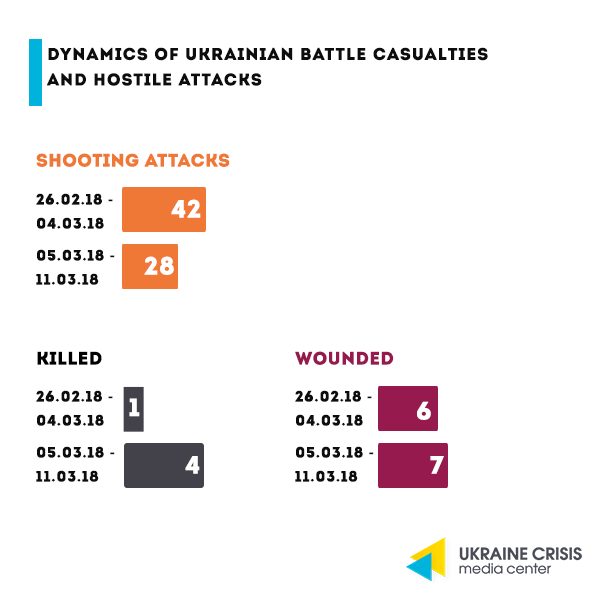 As another ceasefire came into effect on March 5, Russia-backed militants decreased the number of attacks to three-five per day as well as decreased the use of the Minsk-proscribed weapons. Unfortunately, the number of casualties among Ukrainian troops only grew. Diplomatic statements. Kurt Volker, the US Special Representative for Ukraine, states that Russia does not live up to its commitments under the Minsk agreements. He said that Russia, while being a signatory to these agreements, keeps deploying its military command and does not withdraw its heavy weapons from the region instead of providing efforts for a sustainable ceasefire. 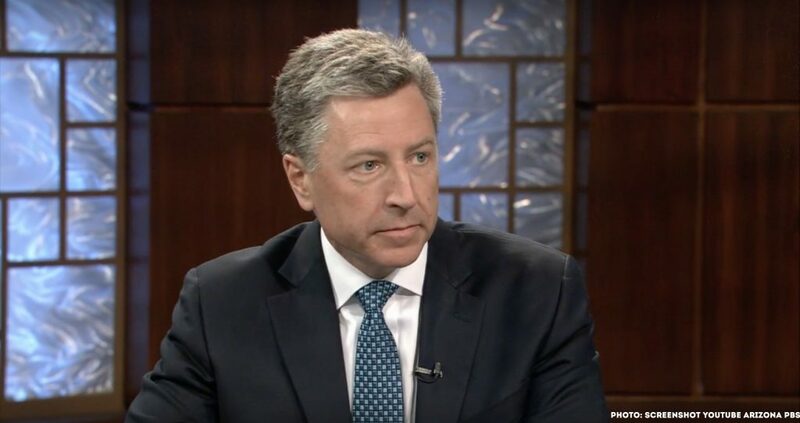 According to Kurt Volker, Moscow would like to see pro-Russian government in Ukraine, while Ukraine’s young generation is totally lost for Russia which is now perceived by them as an aggressor and occupant. The US Special Representative for Ukraine is also of the opinion that Vladimir Putin’s “brag” about the offensive nuclear weapons is nothing but campaigning. The North Atlantic Treaty Organization have officially recognized Ukraine’s aspirations to becoming a full-fledged member. Ukraine thus was granted the status of an aspirant country. “Countries that have declared an interest in joining the Alliance are initially invited to engage in an Intensified Dialogue with NATO about their membership aspirations and related reforms,” the statement on the NATO website reads. What does this actually mean for Ukraine? Is the NATO policy towards Ukraine going to change? No, according to the NATO HQ, recognition of Ukraine’s Euro-Atlantic aspirations and placing this information on the website of the Alliance does not mean that the policy of the bloc is going to change, it just reflects the reality. Comment of the President Poroshenko. Ukrainian President Petro Poroshenko welcomed the NATO decision as to the provision of the status of an aspirant country to Ukraine, he also said that Kyiv’s next ambition is the Membership Action Plan. 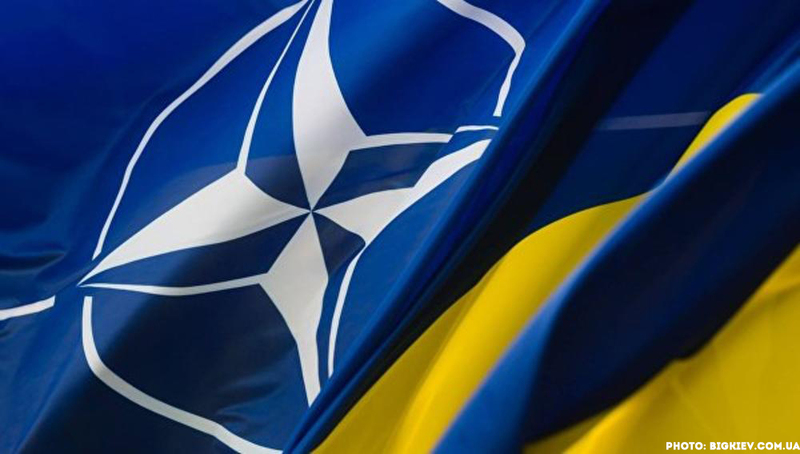 Head of the Ukrainian Parliament Andriy Parubiy stated that it was the decision of Ukraine’s Parliament on NATO membership made in 2017 that became a key impulse for NATO to grant the status of an aspirant country to Ukraine. On March 9, at Maiorsk control point on the contact line in Donbas Ukraine’s Security Service detained Volodymyr Ruban, Head of the initiative “Center for liberation of prisoners” of the Officers’ Corps NGO. 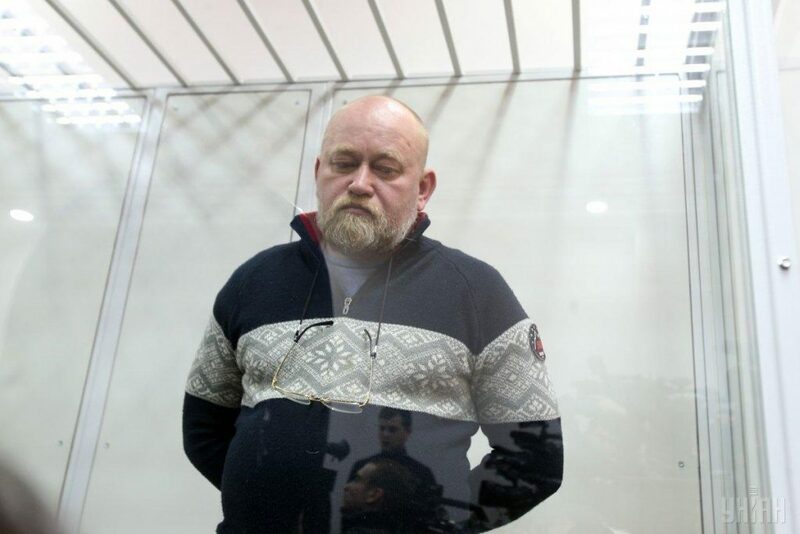 He was charged with illegal weapons possession and preparation of a terrorist attack based on Ukraine’s Criminal Code. The Security Service is convinced that he was preparing large-scale terrorist attacks that would seek as their target to have thousands lethal casualties including senior state officials. However, many journalists doubt this version. Who is Volodymyr Ruban? Volodymyr Ruban is the Head of the Center for liberation of prisoners of the Officers’ Corps – an organization founded in 2013. It used to deal with prisoners exchange and was helping to secure the delivery of assistance to them from the beginning of the conflict in Donbas, until the official Center for liberation of prisoners was established by the Security Service of Ukraine. Nevertheless, Ruban’s organization continued its activities simultaneously with the official Center for prisoners’ liberation, acting mostly unofficially and without Security Service’s consent. In 2014-2015, Ruban was holding massive prisoners’ exchanges negotiating with militants of the “DPR” and “LPR”, going back and forth to the occupied Donetsk. Ruban’s visits to the occupied territory. The negotiator often traveled to the occupied territory. It was exactly under his assistance that MP Nadiya Savchenko went to the occupied area in February 2017 visiting the penal colony no.32 in Makiyivka where Ukrainian prisoners were held at the time. Ruban also helped Savchenko meet the leaders of the so-called republics prior to her seeing the prisoners. Relations with the “DPR” and “LPR”. Militants were not hiding their friendly attitude to Volodymyr Ruban, said First Vice Speaker of the Parliament Iryna Herashchenko. “Regardless of all our efforts militants have not let neither representatives of the ICRC nor the ombudsman to see the prisoners held in ORDLO [the temporary occupied areas of Donetsk and Luhansk region, a formal name for the occupied territories – UCMC], instead they welcomed this ‘truce envoy’ as well as one MP,” Herashchenko wrote on Facebook. Charges by Ukraine’s Security Service. Speaking to the media on March 9 the Head of Ukraine’s Security Service Vasyl Hrytsak claimed that Volodymyr Ruban together with the militant leaders was plotting a terror attack in downtown Kyiv that would have resulted in thousands of casualties. Coordinated by Russia? Ukraine’s Security Service assumes that the illegal actions of the Volodymyr Ruban were coordinated from Russia. Media: skepticism and mistrust. Despite the statements of Ukraine’s Security Service, many experts and media representatives have serious doubts as to whether Ruban could be actually plotting a terrorist attack. The ongoing investigation, as well as the media attention to the case, will cast light on the case details. The Russian Federation and Gazprom do not comply with the Stockholm decision. Gas standoff continues after the Stockholm Arbitration Court (the Arbitration Institute of the Stockholm Chamber of Commerce) presented its ruling. Following almost four years in which the case was being considered, on February 28 the Stockholm Arbitration Court ordered Gazprom to pay to NJSC “Naftogaz of Ukraine” $2,56 billion and obliged Ukraine to buy gas from Russia until 2019. Before the contract expires in 2019 Ukraine has to buy from Russia four to five billion cubic meters of gas annually. Instead of following the court ruling Gazprom claimed it started the procedure to break the contracts for gas transit and supply with the Ukrainian company as well as filed an appeal to the Stockholm Arbitration Court. Ukraine’s position. Gazprom is supposed to be transiting gas through Ukraine based on the decision of the Stockholm Arbitration Court, so no compromises with the Russian gas monopolist are negotiable, the President of Ukraine Petro Poroshenko said. “In accordance with the decision of the Stockholm Arbitration Court, Gazprom must transit gas through Ukraine. This is not its charity, this is not its gesture of Ukraine’s support. This is a direct obligation. Obligations and court decisions must be complied with. End of discussion,” President Poroshenko said. He also emphasized that Ukraine will do its utmost to diversify its energy supplies in the same way that the European Union now has to. The position of the EU. High Representative of the European Union for Foreign Affairs and Security Policy Federica Mogherini visiting Kyiv on March 12 said: “We agree that Gazprom must respect its contractual obligations. The European Commission is having intense talks in these days (…) to try to facilitate a positive solution to this,” she added. During her visit, Mogherini met with the President and the Prime Minister. Gas is not about business but politics. The refusal to comply with the international court’s decision demonstrates that gas is not just business to Russia but rather a leverage providing political pressure on Ukraine and on the EU. 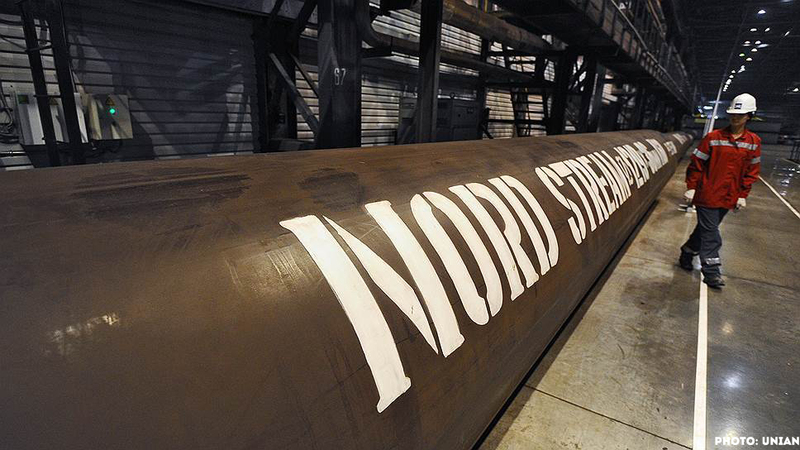 It becomes even more evident in the context of the actual gas escalation that Russia positions Nord Stream 2 gas pipeline as a business project while its key objective is politics. Eastern Europe against the Nord Stream 2. Heads of the Parliaments of Poland, Lithuania and Latvia signed a joint letter in Vilnius stating that the Nord Stream 2 gas pipeline seeks to establish energy dependency of EU member states from Russia. The letter was earlier signed by Ukraine and Moldova. The Prime Minister of Poland Mateusz Morawiecki speaking at the wrap-up meeting with the heads of governments of the Baltic states said that the Nord Stream 2 project is extremely dangerous for the EU.